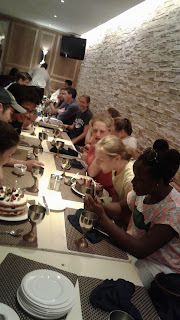 Yesterday while we were still in Delhi, we celebrated the birthdays of Julia and Katy with delicious cakes served at lunch. 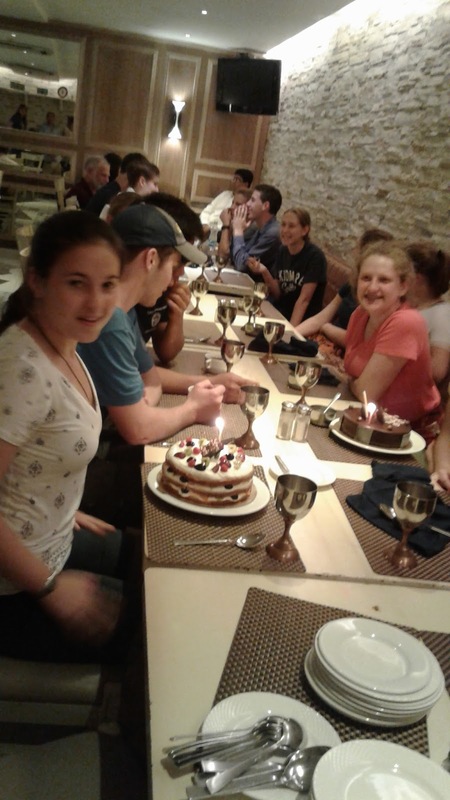 Katy’s birthday was on May 23, but we were on the flight all day and Julia’s birthday was the 25th, our last day in Delhi. Julia’s cake was chocolate and Katy’s cake was a fruit cake. We had a lovely celebration. Today we woke up at 5 AM in order to leave the hotel by 5:45. We had a 6:30 train to catch in the very hectic railway station. We made our way through taxis rickshaws and motorcycles that were buzzing everywhere. It looked like one giant traffic jam, but it was organized chaos! 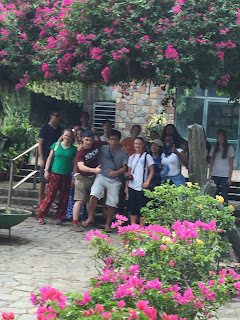 When we got off the bus we had to quickly try to grab our luggage before the porters took them first in an attempt to make some money. The train was quite comfortable; it was air conditioned and we were given breakfast and chai. The ride was about 5.5 hours but it was smooth going and the time went by quickly. Upon our arrival to Dehradun, we were met with a guide who would take us to the orphanage. We were on a large coach sized bus and the driver insisted on driving down the narrow twisted driveway of the orphanage, and somehow he made it in and out with ease. Stepping off the bus was the most exciting part of the day. Each of us got a hug from each of the children. They had huge, grateful, happy smiles on their faces. We were each given a crown or necklace which the children had made from branches and leaves. After settling in and having lunch and tea with the children, we played soccer and volleyball. They were both fun. The children beat us by quite a bit in soccer, but we still have time to improve. In volleyball, however, our scores were very close. We ended the evening with some bucket showers, singing, dinner and lesson planning. Overall, it was a god day!